This has quickly become one of our favorite salads and it's super easy to make. Here's the catch though - I use doTERRA essential oils in the dressing. I do NOT recommend you use any other brand of essential oils as most advise against consuming since they can't vouch for the purity. I rarely have fresh limes or cilantro on hand so I use the essential oils in their place and it works great. As a bonus, when you eat this salad, you won't get bits of green cilantro leaves stuck in your teeth. While I think I have the dressing pretty well figured out, the salad ingredients list here is merely a guideline. I tend to just open the fridge and start chopping and dumping stuff in. I add whatever I have on hand but the black beans and corn are always the foundation. 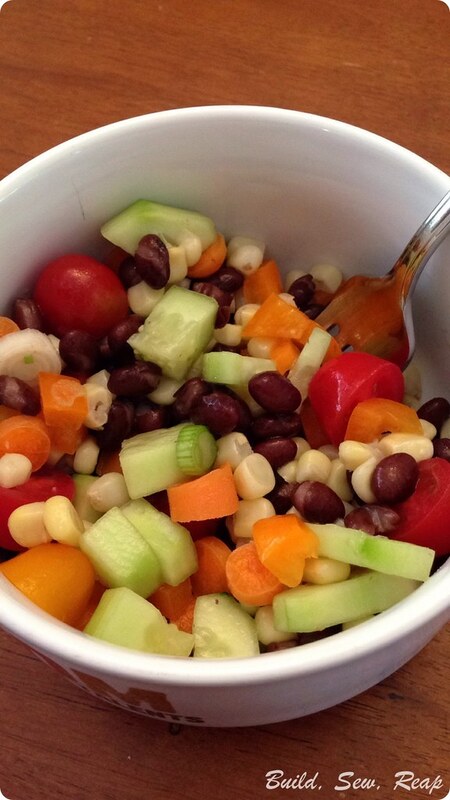 Combine all the non-dressing ingredients in a bowl. Mix the dressing in a measuring cup or separate bowl then pour over and mix well. It's important that you pre-mix the dressing as the essential oils should be allowed to blend together with the olive oil so there aren't any super concentrated drops of essential oils on your vegetables. The flavor won't be as nice if you don't pre-blend. Serve cold. I try to wait until the corn is thawed which is usually the case once I have everything else chopped up.